Rob Scarlett’s hugely popular Brunel range sets industrial style against Mid-century Scandinavian design to create pieces made for modern living. Drawing inspiration from original 1950s designs by the likes of Robin Day and Clive Latimer, this classic shaped sideboard gives glamorous period furnishings an edgy makeover that’s suited to chic urban interiors. Solidly structured from American oak with a soft veneer, the iconic 1950s silhouette of this piece is accentuated by classically styled recessed panelling on the sides, top and cupboard faces. Five deep drawers - two wide on top and three half-width in the centre - have been beautifully crafted to provide ample storage room with expert hand joinery and softly curved edging throughout. Paying tribute to the pioneering use of manufactured elements within modernist design, powder coated metal legs and matching period style spindle handles provide an industrial feel that blends perfectly with the tubular finish of the Brunel range. Five deep drawers - two wide on top and three half-width in the centre. 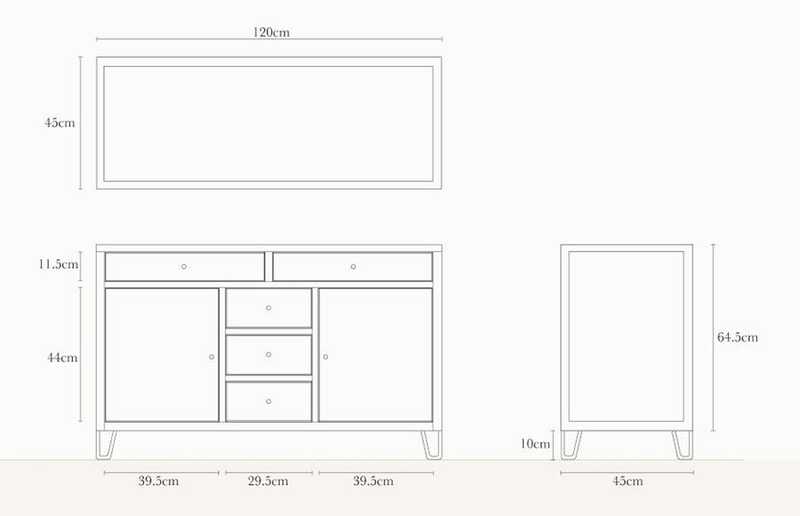 The sideboard is a beautiful piece of furniture, is is very well made, is a useful size and is well designed. I am very happy. The photo on the website does not do the light oak appearance true justice. A very beautiful piece of furniture. Thrilled to find such a well designed and keenly priced small sideboard . Sturdily and meticulously made . Much admired . Very little self assembly........just feet and handles so no worries there.